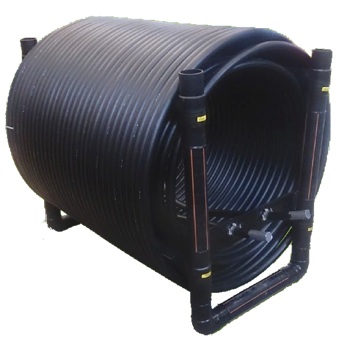 Water is an excellent energy source for geothermal heat pumps, however, installation of the water system pipes in the traditional way, by tying weights to 2 m intervals, has been considered unnecessarily burdensome. The new innovation, WHCEP Mini waterheat exchanger is a solution to this. WHCEP Mini collects the energy from the water, which the heat pump can use for heating and hot domestic water. The exchanger does not need separate weights, 110 mm frame tubes filled with concrete works as an effective weight. WHCEP Mini is also suitable for heating of larger real estate, heat exchangers can be installed side by side. 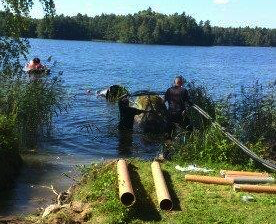 Slide the WHCEP Mini into water, tow it to the sinking location (the exchanger floats on the surface until the ground loop is filled). Fill the Mini WHCEP ground loop with brine and de-air.